The Swedish government funds numerous Israeli, Palestinian, and international non-governmental organizations (NGOs) through the Swedish International Development Cooperation Agency (Sida), the Ministry of Foreign Affairs (MFA), the Embassy in Tel Aviv, the Human Rights and International Humanitarian Law Secretariat (Secretariat), and indirectly by outsourcing to Swedish church groups and aid organizations such as Diakonia. In 2016, Sweden provided at least $14.8 million to NGOs involved in the Arab-Israeli conflict. Many of these NGOs and church aid organizations or are involved in anti-peace activities such as incitement, BDS (boycott, divestment, and sanctions), and legal attacks (“lawfare”) against Israel. Some of these groups also have alleged ties to terrorist organizations. In August 2018, OmVärlden, an online magazine owned by the Swedish International Development Cooperation Agency (SIDA), published 20 articles making numerous false accusations about NGO Monitor. 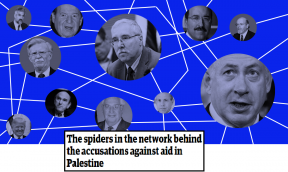 The articles consisted almost entirely of innuendo, factual inaccuracies, and antisemitic motifs reminiscent of the Protocols of the Elders of Zion (spider web, conspiracy theories). Sweden, together with the governments of Sweden, Switzerland, Denmark, and the Netherlands, jointly funded the Secretariat, with Sweden being the lead donor. For 2014-2017, this funding mechanism had a budget of approximately $19.4 million. The funds were managed by the Institute of Law at Birzeit University (IoL-BZU) in Ramallah and a Swedish consulting company, NIRAS. Sida initially provided over $5 million to the Secretariat (2014-2016). In 2017, Sweden extended its funding through 2018, with an updated total commitment of over $9 million. In 2016, Sida paid $34,678 for an internal review of the Secretariat. It is unknown who carried out this evaluation. In 2015, Sida paid $57,950 for an external evaluation of the Secretariat: “Study of effectiveness of core funding to CSOs in the field of Human Rights and IHL in the oPt – Study of effectiveness of core funding to CSOs.” This evaluation was conducted by four individuals, one of whom appears to have worked for Diakonia (see below) and another who was a board member of the Israeli NGO Zochrot (see below). The Secretariat funded highly politicized NGOs that are involved in the whitewashing of violence and terrorism, legal warfare (“lawfare”) against Israeli officials, BDS (boycott, divestment, and sanctions) campaigns, advancing a “1948 agenda,” exploiting the false “apartheid” analogy to discredit Israel, and even promoting antisemitic propaganda. Some of these groups also have alleged ties to terrorist organizations. NGO Monitor has extensively documented numerous concerns relating to the Secretariat. Palestinian Infrastructure Development via World Bank. Local Development through Rehabilitation and Revitalization of the Historic Environment in Palestine, the SIDA agreement partner is UNESCO. Islamic Relief Sweden received $3.7 million (2014-2017) from Sida (see table above). Islamic Relief Sweden also received $3 million indirectly Sida funding through Forum Syd (see below). Islamic Relief Sweden is part of Islamic Relief Worldwide (IRW) and was founded by The Islamic Association in Sweden. In November 2014, the United Arab Emirates banned IRW as a terror organization. In January 2016, HSBC Banking group in the UK severed ties with IRW over terror funding fears. NRC received $1.8 million (2014-2016) from Sida (see table above). Sida provided 6% of NRC’s funding in 2016, down from 8% in 2015. One of NRC’s principal projects in Israel, “Information, counseling, and legal assistance (ICLA),” exploits judicial frameworks to manipulate Israeli policy, bypassing democratic frameworks. In 2014, Sida contributed SEK 4 million to the ICLA program in the West Bank and Gaza. NRC reported funding 4,069 cases from June 2009 until August 2014, via NGOs in Israeli courts. A lawyer affiliated with the NRC program stated that the objective of these cases are an attempt to “try every possible legal measure to disrupt the Israeli judicial system… as many cases as possible are registered and that as many cases as possible are appealed to increase the workload of the courts and the Supreme Court to such an extent that there will be a blockage” (emphasis added). NRC demonstrates a lack of transparency and inadequate accountability. It does not provide information regarding amounts transferred to implementing partners. In addition, some of these NGOs are highly active in damaging lawfare campaigns. Diakonia has received multiple grants from Sida, amounting to nearly $7.8 million (2014-2016) (see table above). In 2014-2017, Diakonia transferred over SEK 16.6 million to its local programs, and its country and regional offices (see table above). Of this, nearly $1.5 million (2014-2016) went to the Diakonia International Humanitarian Law (IHL) program. 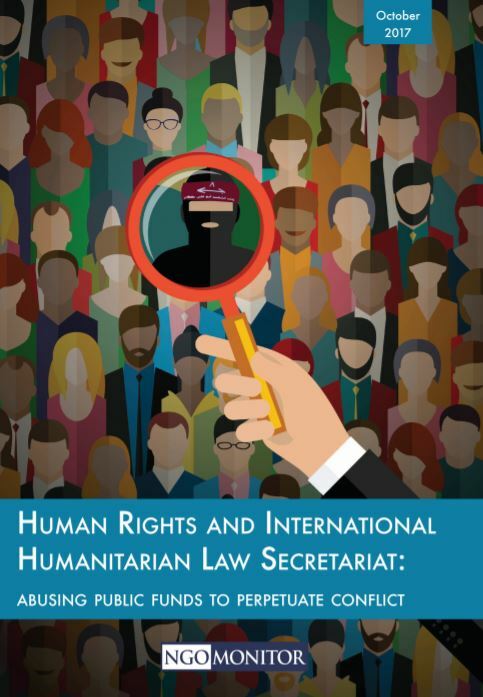 The IHL program, which has its own online “Resource Center,” exploits international law, vilifies Israel, and promotes lawfare campaigns and a narrative based solely on Palestinian victimization. The IHL program focuses exclusively on Israel, and Diakonia does not conduct similar types of programs in terms of content or resources in any other conflict region in the world. Diakonia also provides funding to local Israeli and Palestinian organizations, but does not reveal how much it provides. Some information is revealed by Sida (see “indirect funding” below). Diakonia supports settlement boycotts and accuses Israel of “collective punishment,” “war crimes,” and “violations of international humanitarian law (IHL),” ignoring Hamas terror attacks against Israeli civilians and Israel’s legitimate right to self-defense. Funds some of the most highly biased and politicized NGOs active in the Arab-Israeli conflict including: Alternative Information Center (AIC), Physicians for Human Rights- Israel (PHR-I), Coalition of Women for Peace (CWP), and Sabeel. Diakonia’s “partners” include Alternative Information Center (AIC), Sabeel, Al-Haq, Al Mezan, BADIL, and Palestinian Medical Relief Society (PMRS) (see “indirect funding” below). The Swedish Council of Churches received nearly $1.6 million (2014-2015) designated for EAPPI from Sida (see table above). Sweden sends about 20 participants on the EAPPI program annually. Upon returning to their home countries, many EAPPI activists use their experience in the West Bank to promote campaigns, including BDS. Kvinna Till Kvinna received multiple grants amounting to over $4 million (2014-2016) from Sida (see table above). In 2015, KtK received 65% of its funding from Sida. NGOs in “Israel and Palestine” received €1.4 million in funding from KtK in 2016, 23% of KtK funding distributed to the entire Middle East region. KtK funds Coalition of Women for Peace (CWP), Palestinian Center for Peace and Democracy (PCPD), The Palestinian Working Women Society for Development (PWWSD), Women’s Affairs Center, Women’s Studies Center, and the Palestinian Center for Human Rights (PCHR). KtK does not reveal funding amounts and other grant details. Some of these details are, however, published by Sida (see “indirect funding” below). The Church of Sweden (CoS) received multiple grants amounting to nearly $1.8 million (2014-2016) from Sida. CoS promotes settlement goods labeling. A 2014 Church of Sweden document states that spending and projects in the Middle East region amounted to SEK 10.2 million. In many cases, it is unclear how this funding is distributed or where the projects are specifically located. NGO Development Center (NDC) received $1.2 million in 2016 from Sida. It also received $1.9million in 2014 (in its role as the precursor to the Secretariat in 2008-20141 ). Sida has committed nearly $5 million to the 2016-2021 funding cycle. In 2015, NDC provided funding to East Jerusalem YMCA, Health Work Committees (HWC – see below), Palestinian Youth Association for Leadership and Rights Activation (PYALARA), and Palestinian Medical Relief Society (see below). PMRS received $3.6 million (2014-2016) from Sida (see table above). Sida committed over $5.3 million to support of PMRS (2016-2020). Sida provided over $4.8 million to PMRS from 2012-2015. GCMHP received $2.7 million (2014-2016) from Sida (see table above). Oxfam received nearly $2.4 million (2015-2016), as part of a total funding package of approximately $10.8 million for 2015-2020 from Sida (see table above). Oxfam consistently paints a highly misleading picture of the Arab-Israeli conflict, departing from its humanitarian mission focused on poverty. Most Oxfam statements erase all complexity and blame Israel exclusively for the situation, and these distortions and their impacts contribute significantly to the conflict. Oxfam claims to work with over 60 partner organizations in Israel, the West Bank, and Gaza, but does not name these organizations. International Federation of Human Rights (FIDH) received $2.3 million (2014-2016) in core funding as part of a $5.2 million project (2012-2017). In March 2017, Sida funded a document written by Al-Haq, International Federation of Human Rights (FIDH), Association France Palestine Solidarité (AFPS), CCFD- Terre Solidaire, and the French League of Human Rights (LDH) that recommends that the French government pressure French financial institutions to “disengage without delay from any financial link with the Israeli banking system” and create “a legislative proposal prohibiting enterprises from all sectors to invest in the settlements.” The document only points to very minor and indirect connections, if at all, to settlements, and French courts have repeatedly found that such business activity is not illegal. ECFR received nearly $500,000 in 2016 and $118,000 in 2017 from Sida. ECFR writes extensively on what it calls the “differentiation” policy, calling for sanctions against Israeli entities (and certain individuals) that have activities in or apparent financial contacts with Israeli settlements, claiming that this does not constitute BDS. HWC received $1.2 million from Sida in 2017 for a $3.7 million project (2017-2020). HWC received SEK 2.1 million (2015-2017) from Individuell Människohjälp (IM) for a similar project (see “indirect funding” below). The relationship between HWC and Union of Health Work Committees (UHWC) is unclear, but the two have been referred to as “sister organization[s].” UHWC is a Popular Front for the Liberation of Palestine (PFLP) affiliated health committee active in Gaza, as identified by USAID and in Palestinian documents. The PFLP is a terrorist organization designated as such by the US, EU, Canada, and Israel. ICHR received approximately $1.2 million (2014-2016) from Sida. Sida has committed approximately $1.3 million to the ICHR for 2014-2017. Pingst received $644,721 (2014-2016) from Sida (see table above). PMU provided SEK 5.1 million to “Palestine” for development projects and SEK 99,774 for humanitarian projects in 2014. Pingst and PMU do not reveal which organizations they fund or how much they provide to these NGOs. Swedish Mission Council South is an umbrella group of 34 Swedish church groups, including Caritas Sweden and PMU. Swedish Mission Council South received multiple grants amounting to $1.4 million (2014-2016). It is unclear from its website and annual reports what the organization does in the West Bank and Gaza. Coordinates projects with Diakonia, Pingst, and the Church of Sweden. Forum Syd received grants totaling nearly $1.9 million (2014-2016) from Sida (see table above). Forum Syd does not appear to work directly in the West Bank and Gaza, but rather funds international NGOs that channel funds to NGOs in the region, including Palestine Solidarity in Sweden (Palestinagrupperna i Sverige – PGS), Islamic Relief Sweden, and Föreningen Emmaus Björkå (see below for more details about these organizations). We Effect received grants totaling nearly $3.3 million (2014-2016) from Sida (some funding cited as Swedish Cooperative Center). We Effect’s project expenses in the West Bank and Gaza were SEK 11.4 million (2015) and SEK 17.7 million (2014). Save the Children received grants totaling $1.8 million (2014-2016) from Sida. Save the Children also received SEK 1,250,000 in 2015 in Swedish co-funding for EU funded activities in the West Bank and Gaza. Funding to specific NGOs is not revealed. Save the Children works with NGO partners. For example, it funds a project called “Child’s rights and Child Protection in OPT” with a budget for 2017 of SEK 6.6 million. Implementing partners and organizations are unclear, however, a similarly named 2015 project (SEK 6.0 million) lists implementing organizations as: Al Mezan, Al Dameer, PYALARA, Independent Commission for Human Rights, and Sawa and partners as Defence for Children International – Palestine, Al Mezan, Juzoor Foundation for Health & Social Development, Aisha, Palestinian Counselling Center, and Palestinian Center for Democracy and Conflict Resolution. The Olof Palme International Center received grants totaling $4.2 million (2014-2016) from Sida (see table above). Supports a settlement product labeling campaign. The Olof Palme Center partners with PYALARA – The Palestinian Youth Association for Leadership and Rights Activation among others. It does not reveal funding to these organizations (see table below). An “Unspecified” project, for “Urban development and management,” which has received over $45 million since 2012, out of a total commitment of $50 million. No further information is provided. Another program, labeled as “Conflict prevention and resolution, peace and security: Civilian peace-building, conflict prevention and resolution,” which received over $4 million from 2004-2015. No further information is provided. The evaluation was written by Jessica Montell, a member of the Secretariat’s Reference Group and former B’Tselem Executive Director. The Swedish government failed to respond to NGO Monitor’s concerns about conflicts of interest in this evaluation. Diakonia has transferred nearly SEK 8 million in Sida funding to NGOs in Israel, the West Bank, and Gaza since 2014. Received SEK 1.4 million (SEK 360,000 per year from 2014-2017) from Diakonia. Received SEK 1.5 million (2014-2017) from Diakonia. Releases videos regularly on its YouTube Channel glorifying “resistance” and condemning Israel. Received SEK 2.5 million (SEK 630,000 per year 2014–2017) from Diakonia. Prior to the organization’s founding, AIC co-founder Michael Warschawski was a leader of “Matzpen,” the anti-Zionist Trotskyite organization. Warschawski was jailed in the 1990s for publishing an informational pamphlet for the PFLP terror group (verdict on file with NGO Monitor). Co-director of AIC Nassar Ibrahim is former editor of El Hadaf – the PFLP’s weekly publication. Received SEK 2.5 million (2014-2017) from Diakonia. In October 2015, during a wave of violence against Israeli civilians, PHR-I, along with other politicized NGOs in Israel, called upon Israel to end its policy of “extrajudicial killings” and “collective punishment.” The group criticized Israeli policy and actions of self-defense, without even noting the intensification of attacks against Israelis. Received SEK 4.1 million (2014) from Diakonia. Founding member of the ACT Alliance, which promotes rhetoric against Israel, international BDS campaigns, and the Kairos Palestine document – that characterizes terrorist acts of “armed resistance” as “Palestinian legal resistance,” denies the Jewish historical connection to Israel in theological terms, calls to mobilize churches worldwide in the call for BDS, and compares Israel with the South African apartheid regime. Diakonia transferred over SEK 12 million (2014-2017) to Diakonia MENA and Jerusalem offices (see table above). This includes over SEK 1 million budgeted in 2016-2017 for the Palestine Civil Society Development Program. According to Diakonia, “PCSD program during 2016-2020 will partner with 10-12 CSOs and networks of partner organizations.” Diakonia does not disclose funding to all partner organizations. The funded project is implemented by Islamic Relief Palestine. Palestine Solidarity in Sweden (Palestinagrupperna i Sverige – PGS). PGS utilizes “apartheid” rhetoric and supports BDS campaigns against Israel. PGS provides funding to Gaza Community Mental Health Programme (GCMHP) and Palestinian Medical Relief Society (PMRS), ActiveStills and Worker’s Action Centre-Maan. Föreningen Emmaus Björkå is a Swedish second-hand store that supports women’s project in the West Bank. As part of a BDS campaign, supported a petition against Volvo, along with Palestine Solidarity Association in Sweden (PGS). HWC received SEK 2.1 million (2015-2017) from Individuell Människohjälp (IM) (see table above). PMRS received SEK 790,678 (2017 budgeted) from IM. PMRS’ President, Dr. Mustafa Barghouthi, referred to the Gaza conflict as a “horrendous massacre,” and used the terms “ghetto” and “apartheid” on a radio program. Kvinna Till Kvinna transferred SEK 8.6 million (2015-2017) to its regional offices. Received SEK 576,752 (2015-2017) from KTK. Received SEK 988,637 (2016-2017) from KtK (see above). KtK funds a project with WSC and WAC called “Bereaved to Bereaved,” which “support[s] women whose homes have been demolished and family members have been killed or imprisoned, as a result of the occupation.” This project does not indicate that those family members almost certainly were engaged in violent activities. Olof Palme transferred SEK 1.2 million (2015-2017) to its local offices. Received SEK 1.7 million (2015-2017) from Olof Palme Center. Received SEK 1 million (2016-2017) from Olof Palme Center. YWCA of Palestine received SEK 2.5 million (2015-2016) from Swedish Mission Council. YWCA of Palestine and YMCA of East Jerusalem founded the “Joint Advocacy Initiative (JAI).” The JAI promotes the Kairos Palestine document, which characterizes terrorist acts of “armed resistance” as “Palestinian legal resistance” and support BDS campaigns. Received SEK 675,000 (2016-2017) from the Church of Sweden. Who Profits initiates international BDS campaigns, targeting Israeli and foreign banks, security companies, civil infrastructure facilities, and private companies. The regional chapter of the WCC, called the Middle East Council of Churches (MECC), was founded in 1974, and includes the Department of Service to the Palestine Refugees (DSPR), a branch that is specifically designated to promote the Palestinian refugee narrative. Promotes BDS campaigns, utilizes “apartheid” rhetoric, and seeks to attack Israel using Christian theology. Received SEK 2.7 million (2015-2017) from We Effect. Until 2014, NDC managed the pooled finances of Switzerland, Sweden, Denmark and the Netherlands through its Human Rights/Good Governance (HR/GG) program. In 2014, pooled funding to the NDC was replaced by the Human Rights and International Humanitarian Law Secretariat (“Secretariat”), managed by the Institute of Law at Birzeit University and Niras. Sweden's new envoy to the Arab-Israeli conflict will become another vehicle for counterproductive funding for fringe NGOs. The report of the Commission of Inquiry on the 2014 Gaza War extensively quotes biased and unreliable political advocacy NGOs, many of which receive funding from the Human Rights and International Humanitarian Law Secretariat, a joint funding mechanism of Denmark, Sweden, Switzerland, and the Netherlands. 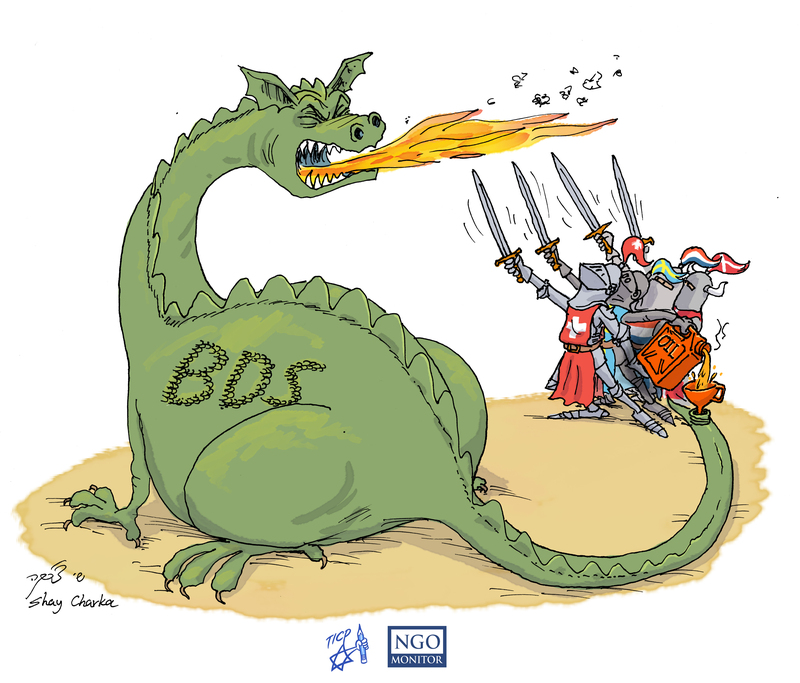 A government donor consortium managed by Denmark, Sweden, Switzerland, and the Netherlands, provides millions of dollars to Israeli and Palestinian NGOs that engage in legal and political warfare to demonize Israel. The demonizing language used by a leading Secretariat official raises fundamental questions about whether donor countries are implementing effective oversight regarding their funding program. The Swedish government funds numerous Israeli and Palestinian NGOs that lead campaigns and political activities that are inconsistent with Swedish government policies to promote peace and a two-state framework for the Arab-Israeli conflict. On July 1, 2009, Sweden will assume the presidency of the European Union. Swedens role in funding numerous NGOs that pursue radical political agendas, including rejecting any form of normalization with Israel, fuels the conflict. Diakonia international law project that uses distorted and misleading interpretations of international law. Funding for the AIC, PCHR, and Al-Haq. Sabeels Nakba Memory program. Other NGO grantees use apartheid, ethnic cleansing, and massacres rhetoric. Many NGOs receive Swedish funding from multiple sources, raising questions about administrative procedures and oversight. The Swedish Swedish government indirectly funds a Swedish NGO, the Palestinian Solidarity Movement (PSM) of Sweden. Some of this money is used specifically to influenc[e] Swedish foreign policy. PSM is also an active promoter of BDS campaigns. Diakonia is Swedens largest humanitarian NGO, receiving most of its budget from the Swedish government. Some of the organizations programs appear to be genuine and important humanitarian projects. Diakonias Civil Society and International Humanitarian Law (IHL) programs overtly promote the Palestinian narrative, and fuel the conflict. Attributes structural problems in the conflict solely to the continuing of the occupation, the building of the Wall, and the fragmentation of the Palestinian territory. The IHL website promotes a so-called right to resist and delegitimizes Israels right to self defense.